Cherie Bosard-Dutton is a local group manager for Moms Demand Action NC. 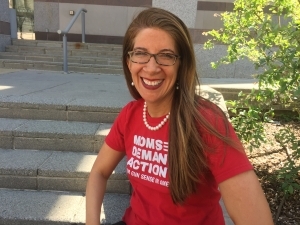 Moms Demand Action – NC is a non-partisan group that’s part of a national organization, Moms Demand Action for Gun Sense in America, that’s fighting for public safety measures that can protect people from gun violence. “There’s currently a bill proposed that would allow arming our teachers and we are absolutely opposed to that,” said Cherie Bosard-Dutton, a local group manager for Moms Demand Action NC. North Carolina lawmakers are considering two new bills that would allow teachers to carry firearms on school grounds. And Senate Bill 192 – The School Security Act of 2019 – would incentivize teachers to carry concealed weapons, provide training and pay raises for teachers who undergo law enforcement training, and make them sworn law enforcement officers too. Bosard-Dutton, speaking shortly after the group’s meeting at Church of the Good Shepherd, said the lawmakers are also being pushed to adopt an Extreme Risk Protection Order (ERPO), which essentially a red flag law that permits police or family members to petition a state court to temporarily remove firearms from a person who may present a danger to others or themselves. “After the Parkland shooting [at Marjory Stoneman Douglas High School in 2018] in Florida, that’s what Florida passed to hopefully prevent something like that from happening again,” Bosard-Dutton said. State Rep. Marcia Morey of Durham filed a bill last year to establish an ERPO law but House Speaker Tim Moore sent it to the House Rules Committee where it died. Morey has filed another bill this session, HB 454, which would establish ERPOs to temporarily remove weapons from people who pose a risk to themselves or others. Bosard-Dutton said asking teachers to carry firearms is not the best way to keep students safe. Previous PostU.S. House passes bill to revive Obama-era net neutrality rulesNext Post Mark Meadows – climate policy champion? I am a teacher; I would be paralyzed with fear if I knew that some of my colleagues were carrying guns. Some students would make it their mission to locate any gun hidden on campus, and students and staff who are gun violence survivors would be re-traumatized. Human beings make mistakes, so what happens if the gun is left unattended for a moment? How do police determine which adult with the a gun is the bad guy? How does a teacher with 30 students in her charge also assume the role of sharpshooter, and how does she make sure to hit her mark, given minimal training? How does our state find the funds to temp would-be heroes to carry a firearm on campus, when NC cannot afford to supply adequate resources to our schools or salaries for teachers commiserate with their responsibility and training? This idea is ludicrous, and I do hope our lawmakers honor the wishes of educators and parents to keep our schools safer by getting guns out of the hands of dangerous people instead of putting guns in schools. Ms. Browder, would it likewise paralyze you with fear to know the person standing behind you at the grocery store was likewise armed? If you were the lady standing in front of me at Food Lion yesterday, that was the situation. I carry legally anywhere I am allowed to do so and avoid those places where I am not. In all the years I have carried a gun, not once have I been asked if I was armed outside of at traffic stops after I informed the police officer I had a carry permit. You are not less safe because I or someone like me carries and comes within arms reach of you. Why? Because I have no ill intent. OTOH, I’m not interested in being anyone’s victim either. Here’s food for thought. Maybe the guy standing behind you is armed but has no permit. Obviously he has no fear of getting caught. I wonder what his intent might be in that case? Getting back to the schools, what keeps anybody from bringing in a gun now? Unless you have armed guards manning a metal detector at all entrances: nothing. That’s why people keep getting killed. If I were a teacher, and was unfortunate enough to be present at a school shooting incident, I would want more than a stapler to defend my students. 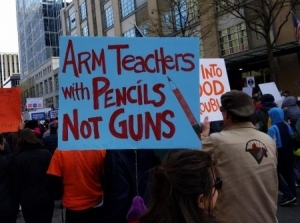 No one is forcing teachers to be armed, it would be a strictly volunteer program and the teachers will be well trained.